...and lots more to help you plan and enjoy a great day on the water. Print the whole guide or individual pages for reference, or download it to your smartphone for easy access on the go. Get the Maine Fishing Guide Data layers! MDIFW staff have packaged several data layers including fisheries info, management regions, lake and pond depths, campgrounds, public boat launches and more all into Google Earth for the tech-savvy angler. 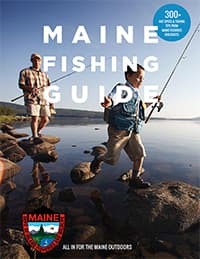 Think of it as an optional companion to the Maine Fishing Guide, packed with specific details about Maine's inland fisheries.